A stunning discovery is taking our idea of what a well-known dinosaur looked like and turning it on its head. 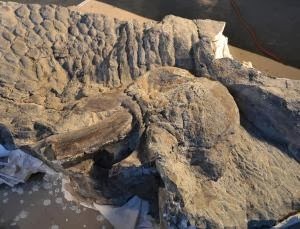 The mummified skeleton of a duck-billed dinosaur, Edmontosaurus regalis, unearthed from beneath a boulder along the Red Willow river in Alberta, Canada, has a never-before-seen crest atop its skull. "We're constantly being surprised by the weird and wonderful array of structures that these animals evolved," says palaeontologist Phil Bell of the University of England in Australia. "Animals that were entirely innocuous-looking based on their bones could have been really quite flashy. And there's no reason why similar structures weren't diverse and widespread among the dinosaur kingdom."